I’d like to wish all of the WDN readers a Merry Christmas and a Happy New Year for 2018! And e-mail address beginning “sstrong82” has won Prize Pack #4 taking home the “1997: Dawn of the Attitude” Blu-ray, “Tagged Classics: Unforgiven & Over The Edge 1998” DVD, “Tagged Classics: King of the Ring 1999 & 2000” DVD and a set of “Divas: Postcard from the Caribbean” postcards. Congratulations! If you’re a winner you will contacted shortly to claim these prizes. A new WWE DVD officially released this festive week! 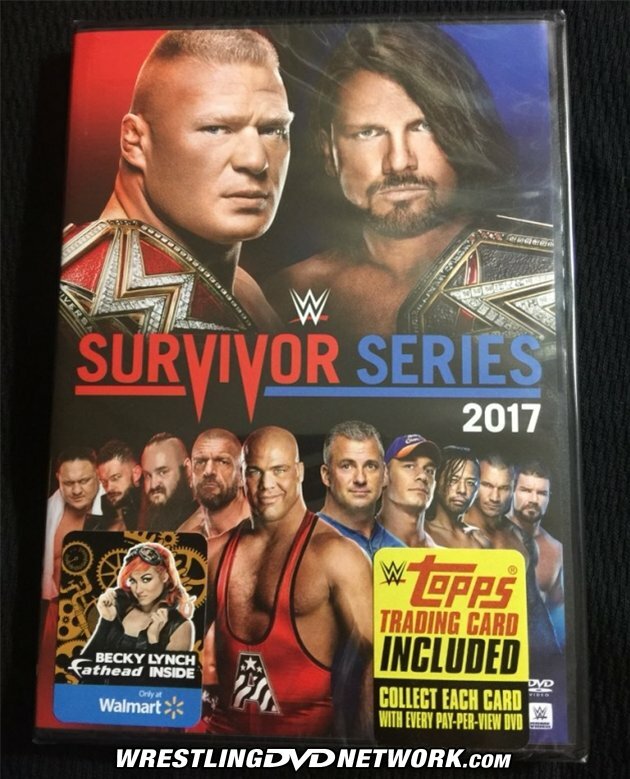 Survivor Series 2017 has landed in stores across the United States (photos) as a 2-disc DVD set that features the entire near-4-hour PPV event and the Kickoff Show matches as extra features. Inside the packaging you’ll find a Goldberg trading card from the Topps “Superstars” series, while Walmart stores are offering an exclusive that also contains a Becky Lynch Fathead. The DVD is in stock and shipping now; gets yours by clicking here to Amazon.com. Ho, ho, ho! No, it’s not The Godfather returning; it’s the latest Retro Review. You can let us know what classic WWE DVD should we cover next by leaving a comment. A condensed 2-hour version of the collection was uploaded to the WWE Network this month. The original, 3-hour, single-disc DVD is hosted by Mick Foley and his daughter Noelle. They’re providing the links from Santa’s Village (which, if you’ve read any of Foley’s books, you’ll know is one of Mick’s all-time favorite theme parks), and throughout the DVD, Foley is attempting to find the man of the hour, the man with the power, too sweet to be sour … Santa Claus! In between, though, we have the real focus of the program, which is to highlight many memorable matches and angles relating to Christmas on WWE television from down the years. What better way to kick this DVD off than a battle with Santa himself? This is more of an angle than a match, as DX set Mankind up for a trap, but it’s entertaining nonetheless. This was the first time I had seen this match, since Tribute to the Troops wasn’t shown in the UK at this point (we got a Best of 2005 show instead). The match is exactly what you’d expect, with the feel-good ending of Foley dropping JBL (though he takes longer to do so than Joey Styles would during another Troops visit a few years later). This is a quick showcase of Xanta Klaus, as the future Balls Mahoney quickly destroys the future Scotty Too Hotty. There’s also a tease during the match by Xanta’s manager Ted DiBiase about the forthcoming debut of The Ringmaster, who of course would transform into Stone Cold Steve Austin! Vince McMahon and Ric Flair, then co-owners of the WWF, were holding separate Christmas parties, with each boasting their own Santa. The two had a confrontation (during which Bubba informed Tazz that his elves were taller than he was), which leads to this match. Watching this reminded me of how over Tajiri was on a mid-card level at this point; the company definitely should have done more with the Japanese Buzzsaw. 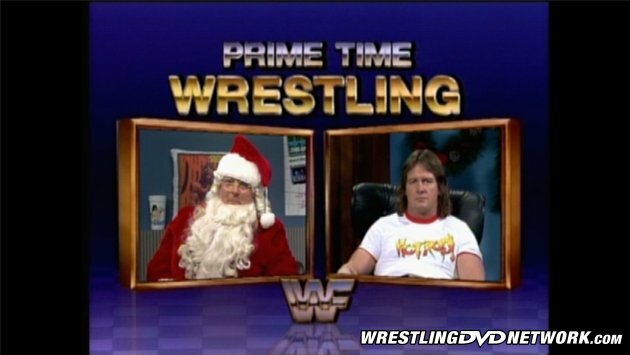 Following a recap of the infamous night on Prime Time Wrestling where Bobby Heenan ruined Christmas for all of the kids watching, we get this mixed tag match. This marked a one-off return for Trish in her hometown of Toronto, as part of a show-long storyline which saw Cena requiring a partner to face Glamarella. A nice moment for Stratus, and a fun bout to rewatch overall. From this chapter, the DVD focuses on several matches apiece from the last few years of WWE Christmas TV. Kofi vs. Kidd is alright (and check out the expression of Kofi on this picture), albeit an unwelcome reminder of Michael Cole’s heel character on commentary. 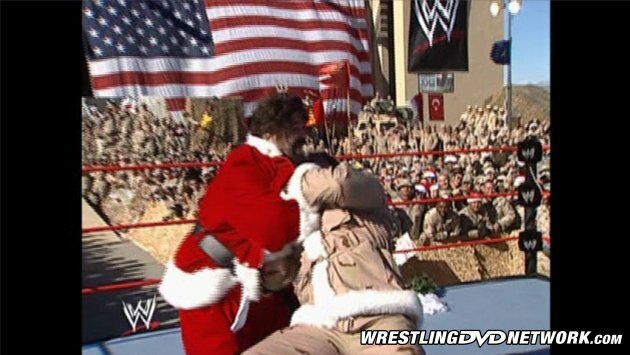 The tradition of a “Miracle On 34th Street Fight” began here, as Orton pounds Otunga from bell to bell, at one time laughing as he tosses a present at David’s head. Good Christmas fun! The concept of this Battle Royal is that the winner will get a wish granted by Santa. Somehow, Hornswoggle comes out on top, and is rewarded with the power of speech. Before the match, we’re shown what I consider to be the most hilariously dark comedy moment in WWE history, where Del Rio accidentally runs over Santa. This leads to Cena exacting revenge on behalf of Santa, and Kris Kringle himself makes a late recovery. Taken as a one-off scenario, the whole thing is perfect for WWE’s Christmas television offering. 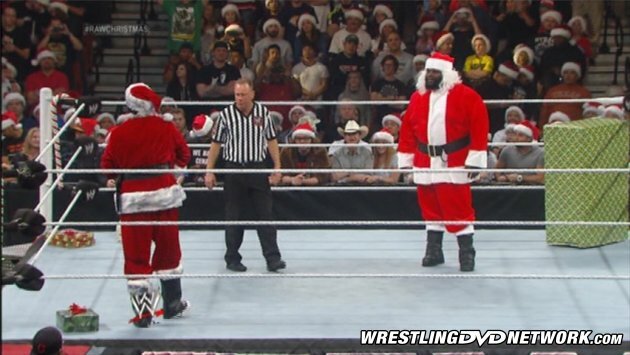 Unlike ADR vs. Cena, there wasn’t really any set-up at all for this match; we were more or less just told that there would be a Good Santa battling a Bad Santa. Of course, good prevails over evil, and Christmas is saved! I had completely forgotten about this match until I rewatched it here. It’s okay but nothing special; the result of Fandango beating Ziggler, who had reigned as World Heavyweight Champion little more than six months earlier, was a sign from WWE that Dolph’s push was well and truly over. This is the standard festive-themed multi-female match that WWE would run on television prior to the “Women’s Revolution” (one cannot imagine the likes of Asuka or Charlotte Flair dressing up as elves for a match in 2017! ); not much to see here. In terms of an actual match, this is the strongest battle on the DVD. There was a real intense feud between these two, which results in both men working hard to get their match over. It also features a pretty dangerous finish by the standards of the PG era. WWE has tended to take its foot off the gas when it comes to the Christmas televisual output (partly because ratings tend to be down because, well, it’s Christmas!). Therefore, the matches often take a back seat to festive-themed angles, and the main storylines rarely have major developments over the holiday season. As a result, only a couple of the bouts here would actually be considered to be worth watching from the standpoint of in-ring action. However, this isn’t to say that WWE at Christmas can’t be entertaining. 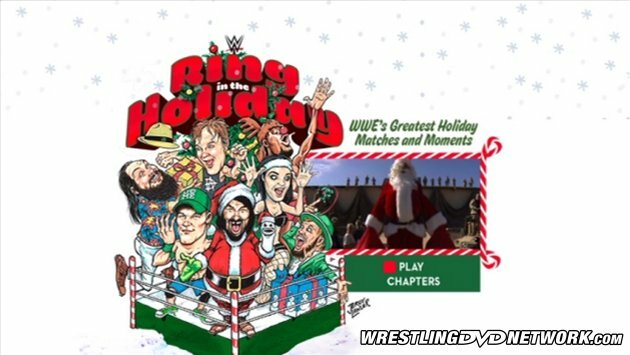 Some of the company’s festive angles are so ridiculous that you can’t help but laugh (the aforementioned mowing down of Father Christmas by Del Rio), and the matches themselves are designed to provide basic feel-good moments, whether it be saving Christmas, making a festive wish come true, or simply good triumphing over evil. Since the PG era began, there has (understandably) been a greater attempt to deliver Xmas television that would appeal to the kids watching, and this DVD generally succeeds at that. Overall, then, it’s far from the greatest WWE DVD ever in terms of the actual wrestling – but that isn’t the purpose of this release. The point of this Home Video is to deliver some positive and/or amusing Christmas television as only the wacky world of WWE can, and therefore it’s a pretty entertaining feature to watch during the course of this year’s festive season. Thanks, I can’t wait to watch the dvds. Congrats! Prizes all shipped off today. I very much agree with the verdict. at least a lot of the content is a lot of fun, despite not being great from a “workrate” perspective. What about best ppv matches 2017 DVD for next week I can’t find it anywhere to preorder for next week!? Best Buy is up to Elimination Chamber 2018 by the way! Yes but you guys have the release date as January 2nd best buy is saying it is releasing January 9th so which date is it? Wow, please calm down; why does it matter in the grand scheme of things anyway, dude? Is the world going to spin of it’s axis if you have to wait until the 9th? All I see you doing is flapping your gums and running your mouth week after week. If you wanna get something done, meet me in the ring at the “Good Golly, Miss Molly” pay per view next month. Oh yeah, tell me more you keyboard warrior you. You could be talking to someone who is 6’6 286 pound female. Watch your pants size yo. I was the one joking saying I’d fight you at an imaginary pay per view and you mentioned punching people in the face along with your imaginary measurements. Also, it’s “You’re” speaking of irrelevant losers.